In 1871 Richard Simpson proposed that Hand D in the Booke of Sir Thomas Moore manuscript was Shakespeares. After many decades of scholarly (and not so scholarly) debate and a range of previous editions, a play based on the manuscript has now been published by that arbiter of the Shakespearean canon, the Arden Shakespeare. Indeed, if one clicks on the link to Shakespeare plays on the A. C. Black website, the ensuing list includes Sir Thomas More. No authors name appears on the title page of this new edition, however. 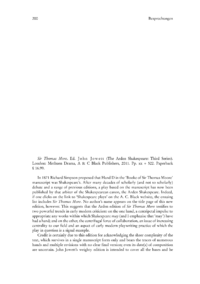 This suggests that the Arden edition of Sir Thomas More testifies to two powerful trends in early modern criticism: on the one hand, a centripetal impulse to appropriate any works within which Shakespeare may (and I emphazise that may) have had a hand; and on the other, the centrifugal force of collaboration, an issue of increasing centrality to our field and an aspect of early modern playwriting practice of which the play in question is a signal example.